Lagos — Former President Olusegun Obasanjo, yesterday, declared that President Muhammadu Buhari has shown "utter incompetence, condones evil and corruption." Obasanjo issued the fresh criticism of the president in an interview with BBC Pidgin. 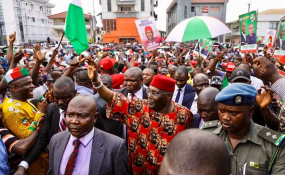 The former President said he believes that presidential candidate of the Peoples Democratic Party, PDP, Alhaji Atiku Abubakar, will perform "two times better" than Buhari. Obasanjo said: "Atiku is not a messiah; he is not a saint. Fortunately, he has not claimed to be. He has not claimed a fake sanctimoniousness. He came here. He acknowledged his past misdeeds and showed remorse. "I am a believer and a Christian as such and the teaching of God in my own religion is to forgive so that you can be forgiven. In fact, it goes further that if you do not forgive, you have no right to expect God's forgiveness. "I'm a sinner and I want God to forgive me sins. So, if anybody who has offended me comes to ask for forgiveness, I must forgive him. That's number one. "Number two, the choice that we have for the immediate in Nigerian situation today and the immediate is 2019 is between the candidate of party APC and PDP. The other minor parties will line behind or not sufficiently relevant. "So, if APC puts down Buhari and PDP puts down Atiku, and from what I know of Buhari and what you know, what he has done and shown is utter incompetence, nepotism, condones evil and misconduct, including corruption. "The weakness of the body, mind and the totality of Buhari, compared with Atiku, I believe Atiku will perform two times better than Buhari. "Now, you can steal the whole of Nigeria and if you belong to APC, you are safe. Corruption is not only stealing money; nepotism is a form of corruption."